Tug is a natural way for dogs to play, with one another as well as with humans. For safety however, it is essential that your dog follow certain guidelines for the game: growling is okay; getting excited is okay; tooth contact with your hand is not okay. Following are some simple guidelines for tug of war. Decide on one tug toy and stick to it. This will prevent your dog from thinking that tug is an acceptable game with her leash or your favorite sweater or whatever else happens to be in your hands. In addition, it will increase your dog’s perceived value of the toy, thus making tugging with you a favorite game. This also helps ensure that your dog will not initiate the game at inappropriate times, and can increase the value of the game as well. In addition, it could potentially prevent your dog from enthusiastically initiating tug when a visitor finds her toy on the ground and picks it up to move it out of the way. Have a start cue such as “tug” or “take it”. Give the cue and then present the tug toy. 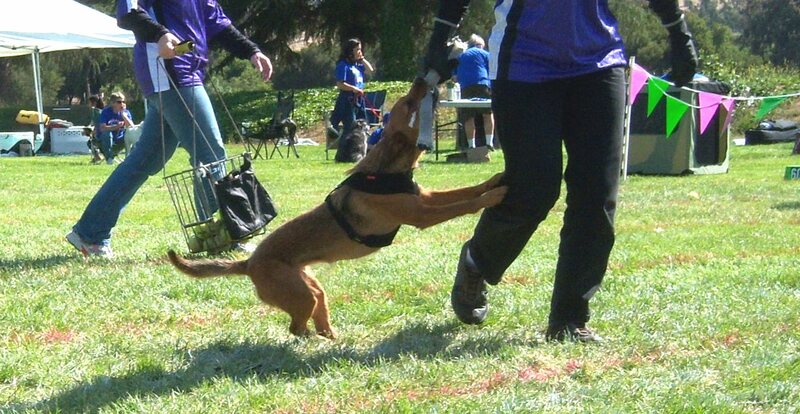 (If your dog is new to tug, see Susan Garrett’s “How to Create a Motivating Toy. Never give the cue without starting the game. If your dog takes the toy before the cue, even if it is dangled at her nose without the cue, end the game and stop interaction with your dog for 30 seconds. If your dog makes the same mistake three times in a row, end the game and put the tug toy away. • Your dog must “out” on command. Decide on a release cue – such as “give” or “drop it”. Practice pre-game exchanges: cue a “take” for your dog to take the toy then cue a release and give your dog a tasty treat in exchange for releasing the toy. If your dog does not release for your cue at first, it’s OK to lure with the treat for a few releases. After a few tries, hide the treat and wait for her to release. If it is challenging for your dog to release on cue, practice “Take it” and “Drop it” with lower value items first until it is more reliable. If your dog resource guards toys, you may want to first teach “Drop It” using this classical conditioning based technique from noted trainer, Chirag Patel. • Interrupt often for training time. During each tug session, interrupt your dog every 30 seconds or so. Stop tugging and give your “out” cue. If your dog does not out, drop the toy and walk away – tug is only fun with two participants! The sooner you interrupt after the initiation of the game, the more likely your dog is to out on cue. When your dog does drop, practice some quick obedience cues, then re-initiate the game as a reward. This teaches your dog to regulate play and keeps your dog from getting overly worked up, as well as teaching him that games and training are fun! • Never tolerate accidental tooth contact. If at ANY point during the play, your dog’s teeth touch your hand even for an instant, say “OUCH!” and end the game immediately by dropping the toy in disgust and walking away. The dog will not think she has won, but will know that if she’s not more careful, there will be no game. There are so many benefits to playing tug with dogs. In addition to the great fun that can only serve to further improve your relationship with your dog, it is great exercise for both the dog and the human. The fact that it’s a controlled game also makes it a great option for small spaces or when close leash control is required, such as at a local park with a strict leash law. If you are unsure about how to play tug with your dog, but are interested in trying it, consider contacting your local Certified Professional Dog Trainer. The pay-off will be a dog that not only loves you as he already does, but wants more than anything to be with you instead of anyone else, human or canine. And after all, isn’t that what we all want? 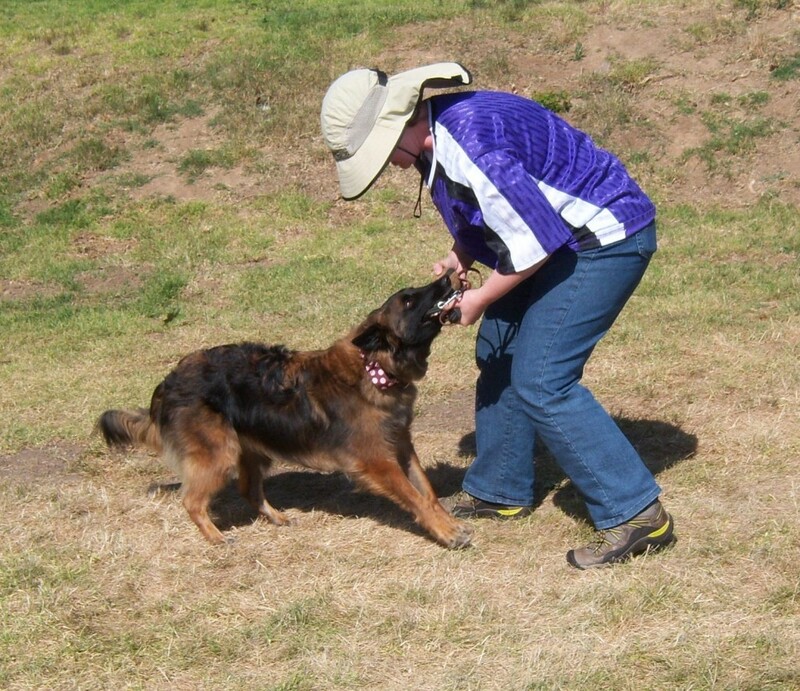 This entry was posted in Dog Behavior, Dog Training Tips by M Cecilia Sternzon. Bookmark the permalink.